I kind of feel some extra pressure this week after introducing my new sweetheart camera. So let's start by saying,...I still don't know how to use it so in fact this week might be worse than usual. :) Just want to get your expectations in the right arena. This week's theme was black and white which, as it turns out, is pretty forgiving. 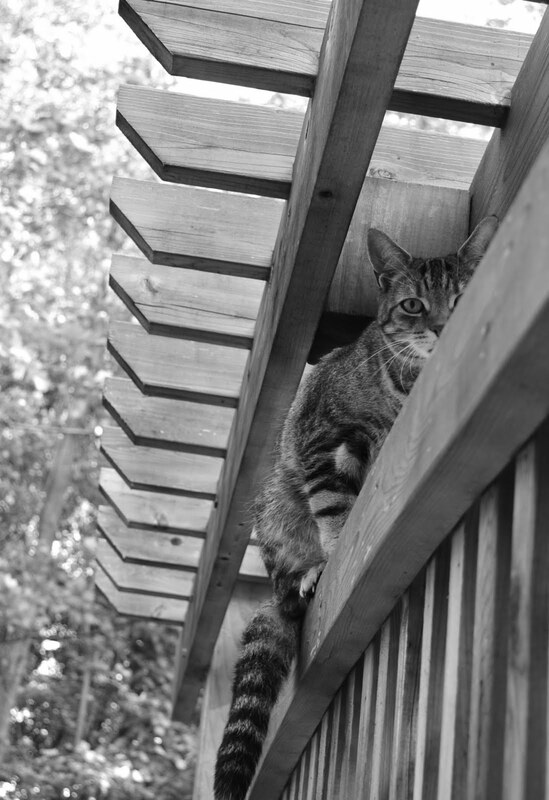 I caught Moe out on the deck so he was the subject. He starts off black and white, so I guess he was a good fit. Terry! These are awesome! That last one is my fave!!! Love the comments in a new window too! So much easier to comment!!! Great Job Terry!! I like the last one too. All the lines are cool. BTW I LOVE the Kevin and Amanda link on your Photo Tips page! Great info and easy to follow! What a cute kitty...great photos! Great photos... I'm liking the angles of the pergola against the soft roundness that is Moe! I just love black and white photography- these would look great framed. Sweet photos! I love the first one especially! LOVE THESE! Moe was unsuspecting! How cool! I have never seen a photo challenge before! I think that I'll have to join in for next week! :-) Yeah!!! p.s. super cute pictures!! !